How is it that we can see an object? That is because light is sent from its surface to our eyes; in other words it is reflected in the direction of our eyes. We get photons on our retina. Each point of the object will send photons and the pattern of the arriving photons will create the image of the object. Sun sends light to pond. We see the image of the sun in the pond. And we also see the pond. Wikipedia image by Thomas & Dianne Jones | "Double reflection: The sun is reflected in the water, which is reflected in the paddle." Sun sends light to a tree. We don’t see the image of the sun on the tree. We see the tree. The surface of the water is smooth and as such it offers the same orientation to the photons coming from the object. The reflection could be said to be "orderly" and as a result a perfect pattern corresponding to the object is formed. This is called "specular reflection". The surface of a tree is uneven. As a result light will be reflected in random directions. This is called "diffuse reflection" and is represented in the following image from wikipedia. When light hits a surface, there are three possible outcomes. Light may be absorbed by the material, light may be transmitted through to the other side, or light may be reflected back. Materials often show some mix of these behaviors, with the proportion of light that goes to each depending on the properties of the material, the wavelength of the light, and the angle of incidence. Reflected light can be divided into two sub-types, specular reflection and diffuse reflection. Specular reflection reflects all light at the same angle, whereas diffuse reflection reflects in a broad range of directions. An example of the distinction between specular and diffuse reflection would be glossy and matte paints. The law of reflection describes the angle of reflected light: the angle of incident light is the same as the angle of the reflected light. The law of reflection arises from diffraction of a plane wave with small wavelength on a flat boundary: when the boundary size is much larger than the wavelength, then electrons of the boundary are seen oscillating exactly in phase only from one direction – the specular direction. If a mirror becomes very small compared to the wavelength, the law of reflection no longer holds, and the behavior of light is more complicated. In film photography the photons coming from objects hit a special emulsion on the film. Their position of the collision and the number of photons hitting each point is recorded on the film. In this way, a record of light intensities is obtained and the pattern created corresponds to the image that is formed. Photography provides a 2D record of photons hitting an emulsion, or the incident light on the film. It provides light intensities. If we would like to have a 3D visualization, we should try to approach the whole track that the photons follow to reach the film or our eye. We would need to know when each photon arrives; this would be similar to trying to find out when two waves arrive at the position of a surfer to create a big wave. Two waves will arrive simultaneously at the position of the surfer is if they are "in phase". In order to have a 3D visualization we need to obtain the "phase" of the incident light. Before light from the object hits the film you must have it interfere with the light that hit the object. Then have the whole thing or the product of interference hit the film. Image from the video further down this page. Red rectangle: Laser light beam hits object on metal base on the right (small car). Object reflects laser light. This is directed towards the film screen. Another laser beam hits mirror so as to be directed on the film screen. Before hitting film screen the reflected beam and the second beam interfere and the interference pattern is recorded on the film screen. Product of interference would like this. Just for information, we could consult in this pdf the two equations with no phase that when combined provide a phase. Use the original light that hit the object? How to do that? Split the original light in two (with a splitter). One more thing. The light to be used must be “coherent” which means that all photons must have the same phase. This is why you need laser light. As you are trying to capture the elusive “phase”, you don’t want to have light with different phases to start with! So what are we going to get on the film? Some kind of mazes (or labyrinths). If we shine light on this film, the light will follow the same path it originally did, with all the different delays etc (phase) and it will reconstruct in our eyes the 3D image that was used for the recording. More information at this YouTube link. Two pure wave sources of same amplitude and frequency. 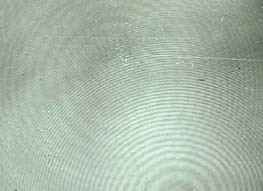 Generated waves form an interference pattern where they cross. These two speakers send out waves of equal frequency and amplitude. The microphone records areas of calm and motion. If we could see the three-dimensional interference pattern caused by the two sound sources it would look like this. Light also travels in waves. We will use a laser to check for interference patterns by passing light through this optical device which splits the beam in two. The interference appears in alternated light and dark lines. Within the fim emulsion areas are exposed as light waves move through. Where the waves run cross each other, the silver emulsion is exposed. The developed emulsion is essentially a thick diffraction grid. To understand holography we can think of the developed layers within the emulsion as a set of microscopic partially reflecting mirrors. This film was exposed with two beams interfering with a third. Now by passing one beam through the film, the other two beams are reconstructed. Note: Another example. Beam hits first obstacle, then second obstacle. The diffractions produce three beams. If a toy car "was illuminated with a laser, every point on it would reflect some laser light. This is how an hologram is made." Note: A toy car is placed on the metal base on the right side of the image above. 1. Part of the beam is used to illuminate the car. We call it the object beam. 2. A second beam, called the reference beam, shines directly on the emulsion. Note: This is accomplished using the circular mirror shown above. It interferes with the light reflected from every point of the car. We will expose the film for 10 seconds. The film looks black but through a microscope we can see interference patterns which bear no resemblance to the real car. Now, when the reference beam alone shines on the processed film, an identical image is reconstructed. What has happened in the emulsion? The reference beam from the left interferes with each reflected lightbeam from the car creating an interference pattern. The emulsion simultaneously records all the patterns caused by all the forces. Now when the reference beam alone shines through the film, each pattern reconstructs its own object beam and thus the whole car appears to be reconstructed. What would happen if the emulsion had been here between the source and the object. In this case the interference produces what is known as a standing wave pattern. Note: An coin is used as an object. If the light shines through the film and reflects back from the coin, there will be standing waves of light in the emulsion. Laser light will shine through and reflect back from the coin. An ordinary white light is used to view this hologram. Why does white light reconstruct this kind of hologram? "First, it uses two antennas: one fixed in place and another that moves. The fixed antenna records a Wi-Fi field's background, or reference (...). The other antenna is moved by hand to record the same Wi-Fi field from many different points." "Both antennas record not only the intensity (or brightness) of a Wi-Fi signal, but also its phase (...)." The notion of phase (empirically) : Are the Wi-Fi waves in phase, in sync, or out of phase, out of sync? "The signals from both antennas are simultaneously fed into a computer, and software teases out the differences of intensity and phase "more or less in real-time," Holl says. "This is where the magic happens: The software builds many 2D images as one antenna is waved around and then stacks them together in a 3D hologram. And because Wi-Fi travels through most walls, those holograms are of objects inside a room." "Fairy Lights in Femtoseconds: Aerial and Volumetric Graphics Rendered by Focused Femtosecond Laser Combined with Computational Holographic Fields"
How much energy is required to produce ionized plasma and therefore a bright picture? "The 30-fs laser can produce plasma from 0.2-mJ pulse energy. The cross-sectional area of the focal point is theoretically calculated to be 2 × 10-7 cm2. Then, the peak intensity is 36 PW/cm2 and surely higher than the ionized plasma threshold (> 1 PW/cm2)." "The laser plasma in air radiates not only visible light but also audible sound. We conducted an experiment to evaluate the radiated sound." "Haptic Feedback on Aerial Images - Shock waves are generated by plasma when a user touches the plasma voxels". "Holographic photo-stimulation for dynamic control of neuronal population activity"
"Instead of processing one interferogram with spatial carrier, as in the 2DFTM, we record a sequence of interferograms, where the phase of interest may be either constant or a function of time. Each interferogram has a spatial carrier and a temporal carrier is introduced between succesive acquisitions by modulating the reference beam. This stack of spatiotemporal data is then processed jointly with a 3D Fourier transform."